With 92% of US adults aged 20 to 64 experiencing cavities in their permanent teeth, it’s no surprise that many people are seeking alternatives to the traditional and costly ‘drill and fill’ route. There are plenty of anecdotal stories which claim that tooth decay has been stopped or reversed by natural methods. But do these approaches work? Is it even possible to heal cavities? Also known as dental caries or cavities, tooth decay occurs when certain types of bacteria, found in the plaque coating teeth, produce a harmful acid which erodes and destroys the tooth structure. These bacteria feed on sugar and carbohydrates in order to thrive and produce plaque acids. If left untreated, this tooth erosion causes pain, infection and tooth loss. Dentists blame factors like poor oral hygiene, junk food, and acidic foods and drinks for tooth decay. Root decay – occurs on the surface of the roots. It is most common among older adults who have receding gum lines. Pit and fissure decay – occurs on the chewing surfaces of the back teeth. Smooth-surface decay – occurs on the outside flat surface of the teeth when plaque builds up. For every person that claims dental cavities can be healed, someone else claims it’s not possible. Let’s look at what the experts and the research say. A 1932 study, published in the British Medical Journal, suggests that cavities and tooth decay can potentially be reversed with diet. Sixty-two school children with cavities were divided into three groups and assigned different diets. It was found that the group who ate lots of grains had an increase in cavities, while the children who ate a grain-free diet and supplemented with vitamin D saw the greatest improvements, with many of their cavities healing. In the 1900s, the renowned Dr. Weston A. Price – a dentist in Cleveland, Ohio – studied many indigenous tribes from around the world. He believed they experienced little tooth decay because of their healthy diets, free from processed foods and phytic acids (an anti-nutrient found in grains), and rich in nutrients, including the fat soluble vitamins A, D, E and K.
These discoveries have inspired many people today to clean up their diets with the hopes of healing their teeth. However, Dr. Paul Rubin, a pioneer in ‘mercury-free’ dentistry and with over 40 years’ experience, says that the mechanism for healing cavities just isn’t there. Rubin also claims that the stories of cavity healing found online are misleading, or just plain fraudulent. Most other dentists also state that cavities cannot be repaired because enamel is the only tissue in the body that has no living cells – which means it cannot regenerate itself. It’s true that certain types of cavities are reversible – a fact all dentists will attest to. 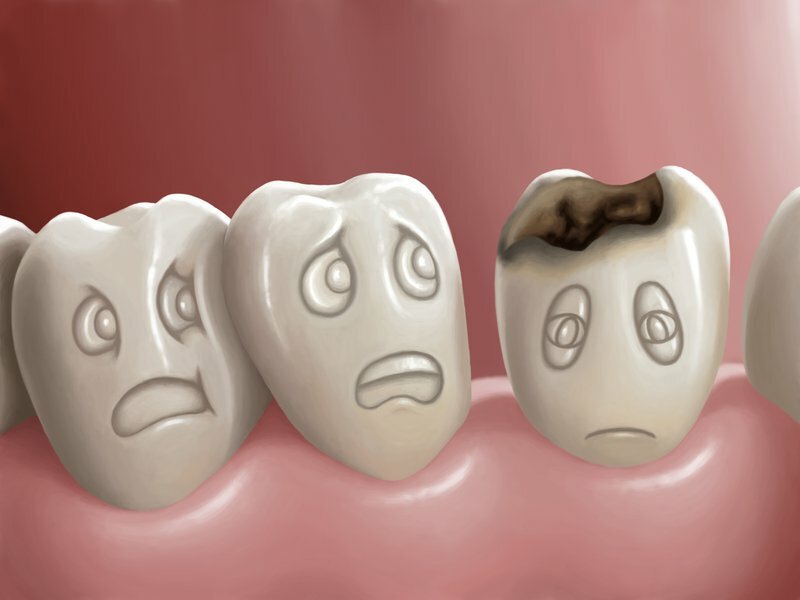 This is the case only when the decay affects the surface enamel of the tooth. If a low sugar and low acid diet is followed, and the right minerals can be applied and absorbed by the tooth, then these surface cavities can technically be healed. But once decay progresses to the dentin – the layer beneath the enamel – it is irreversible. What’s interesting is that enamel is dead tissue, but can be repaired in some circumstances, while the dentin is a sensitive layer of living tissue – yet decay at this level is said to be irreparable. Dr. Charles Payet explains that there is usually too much food matter embedded in deeper cavities to allow the necessary minerals to penetrate. It’s simply not possible to force any kind of substance that deep into the tooth to kill the acid-producing bacteria and to rebuild the mineral matrix. Healing a cavity is known as ‘remineralizing’ (a process that is also referred to as ‘arrested decay’). When a tooth is remineralized, it doesn’t mean that the missing part of the tooth simply grows back. The tooth can, however, return to its normal function as further decay is avoided. Author of ‘How to Stop Cavities: A Natural Approach to Prevention and Remineralization’, Dr. Judene Benoit likens healing a cavity to cutting off a fingertip. The tip will never grow back, but the skin grows over the missing part, preventing infections and functioning as normal. The American Dental Association explains that decay occurs when starchy or sugary foods – like milk, sodas, dried fruits, cakes or candy – are frequently left on the teeth. Bacteria thrive and multiply with these foods, producing the acid that destroys tooth enamel. Reducing your intake of starchy foods, and avoiding sugary treats and sodas, can go a long way toward protecting the health of your teeth and gums. Be sure to check out these surprising sources of hidden sugar. Phytates, or phytic acid, are substances found in grains, beans, lentils, soy, nuts, and seeds. A diet high in phytic acid can cause mineral deficiencies, particularly of phosphorous, calcium, magnesium, iron and zinc – all nutrients important for healthy teeth. Going grain-free is an option for some, but remember that these foods can be an important part of a well-balanced diet. Once properly prepared, they can help to improve satiety, and provide protein, fiber, vitamins, and minerals. Maximize the benefits of these foods while minimizing the risks by soaking, sprouting and/or fermenting them – a common practice in many traditional cultures. Calcium – keeps the enamel strong, and reduces the risk of gum disease and tooth decay. Sources of calcium include dairy, canned sardines, kale, collard greens, broccoli, tahini, and fortified drinks like orange juice and plant-based milks. Magnesium – works with calcium to build strong enamel and prevent cavities. Sources include green leafy vegetables such as spinach, legumes, nuts, seeds and whole grains. Vitamin A – helps maintain a healthy saliva flow to manage bacteria levels. Sources include liver and fish oils, leafy green vegetables, orange and yellow vegetables, cantaloupe melon and mango. Zinc – prevents the growth of bacteria and the build-up of plaque. Sources of zinc include seafood, toasted wheat, cashews, beef, pork, chickpeas and kidney beans, pumpkin seeds and sesame seeds. Iron – vital for transporting oxygen through the body, too little iron can contribute to infections and bacteria build-up in the mouth. Sources include liver, seafood, beans, tofu, pumpkin seeds and sesame seeds, canned sardines in oil, baked potato and broccoli. Vitamin D – this incredibly important vitamin helps the body utilize calcium. Sources of vitamin D include egg yolk, beef, seafood, cod liver oil, fortified foods and, most importantly, sun exposure! Phosphorous – protects tooth enamel and helps replace minerals in teeth. Sources include sunflower seeds, beans, tuna, turkey, beef, almonds, brown rice, potatoes and broccoli. These foods have a high water content, which dilutes the effects of the sugars they contain. They also stimulate the production of saliva, which helps guard against decay. By practicing good oral hygiene – and brushing at least twice daily and flossing regularly – you will remove the plaque that feeds acid-producing bacteria. You can also practice oil pulling, learn how to make your own toothpaste, and try this antibacterial homemade mouth rinse. Apply important tooth minerals directly onto the surface of your teeth with a remineralizing toothpaste or a remineralizing tooth powder – such as this activated charcoal remineralizing powder. Alternatively, if you fancy making your own, this recipe uses calcium powder, diatomaceous earth, baking soda, xylitol, coconut oil and essential oils. Acid reflux can be more damaging to teeth than sodas, energy drinks and other foods. Surprisingly, most people with heartburn have low levels of stomach acid, rather than too much! Learn to address your stomach acid issues for the health of your teeth. Saliva is vital for a healthy mouth and digestion. Proper saliva flow helps kill bacteria and contains proteins and minerals to protect tooth enamel and prevent decay, gum disease and bad breath. Dehydration, certain medications, illness, stress, smoking and advancing age are all risk factors for dry mouth – which can increase the incidence of cavities and other oral health issues.